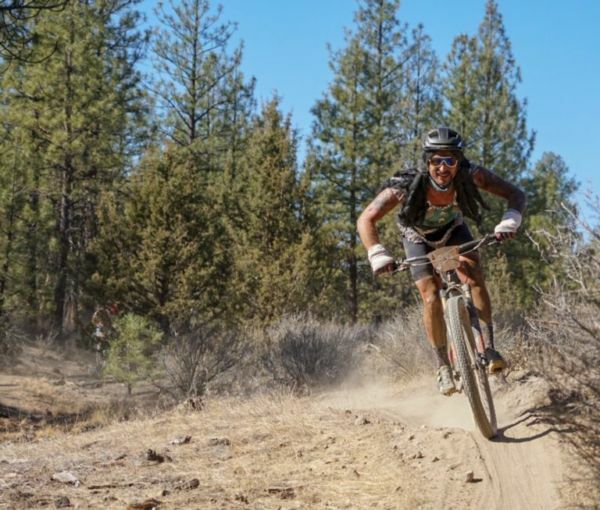 I toed the line at my first Single Speed World Championships (SSWC) in 2002, the year it was held in Downieville, CA, and won by MTB legend, Travis Brown, who, oddly enough, lent a hand, or a skinsuit more like it, to this year’s winner, Payson McElveen. 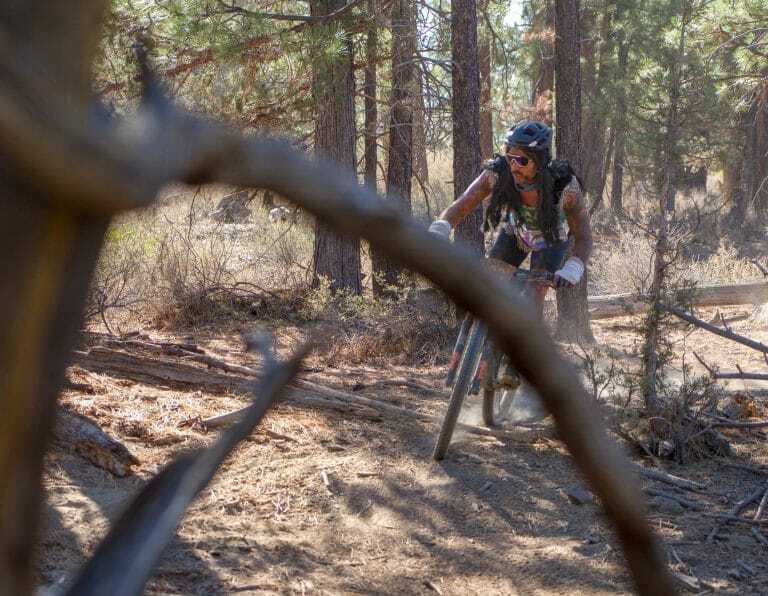 I didn’t return to another SSWC until 2008, when Curtis Inglis, and his band of merry pranksters, masterminded a hopping good time at Skyline Park in Napa, CA, site of a few UCI MTB World Cups back in the day. 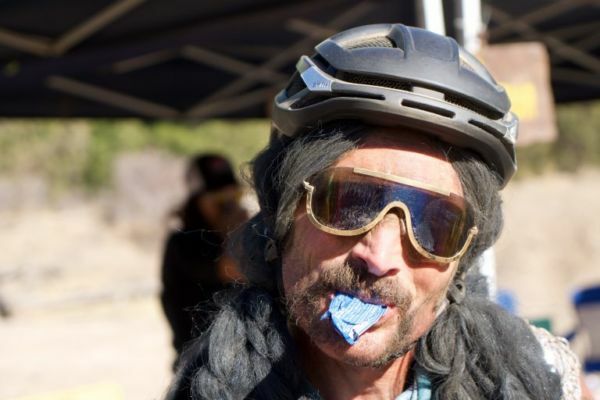 That year’s Decider-the event/activity used to secure hosting rights for the next year- was a bowling match, won by none other than Durango’s Chainsaw Chad Cheeney, a legend in fashion, riding, wedding pool party dives, and neckbeards. And as it turns out, also moonlighting as an otherworldly race promoter. Along with folks like Doom, Jon Bailey, and the rest of the Passion Productions crew, Chainsaw orchestrated an amazing 2009 event, one that attracted over 1,200 riders. The Decider was a full court basketball game, players dressed in retro outfits created by the Passion Production folks. I raced that year in a bumble bee outfit and finished somewhere in the late 40s, I think. I do remember someone on course with bacon and other items/instruments that started with B. And that was the last time I attended a SSWC event….until this year. “If you wanna bring a costume? 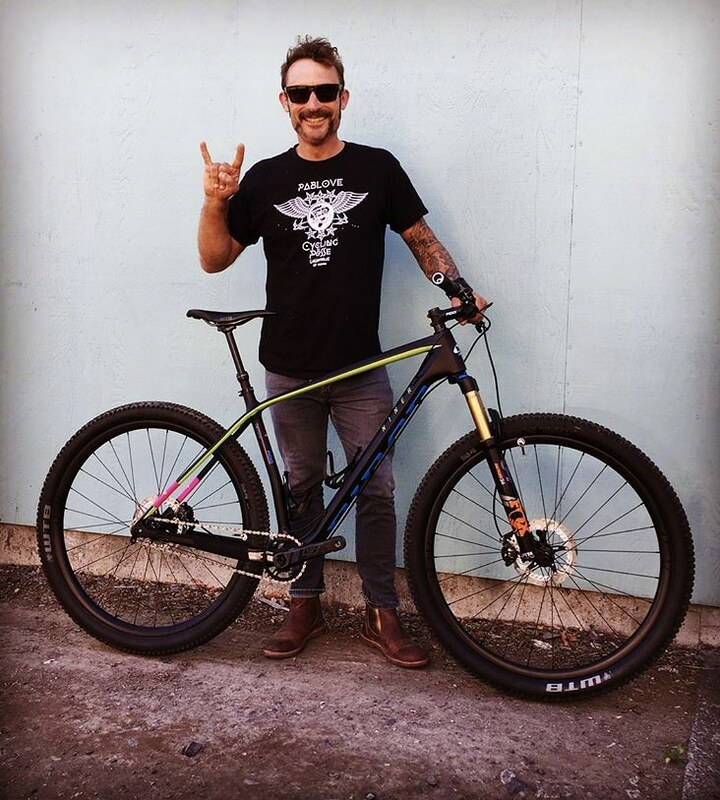 That’s fine, but don’t expect an award or a handicap on the length of the course.” These are the opening words of the 2018 Single Speed World Championship website. The funny thing is the guy who most likely wrote those words loves wearing costumes. See, Carl Decker, the 2008 SSWC Champion who crossed the line that year in a speedo/Zoro outfit, cape, and bottle of KY taped to his top tube, was one of the cogs in the rear cassette of hard-working folks responsible for this year’s amazing bacchanalian bike party better known as SSWC, which was hosted in beautiful Bend, OR. Knowing that Tina, Carl, Matt, Adam, and a whole host of other amazingly motivated folks, were part of the organizing crew behind the Bend, OR, SSWC event, made it a must-do bike party/race. I packed my van, grabbed my yet to be raced Niner AIR 9 RDO, threw Hippie Kid 2.O in the rig and hit the road. We spent a chilly night on a forest road just outside Weed, CA, and finished the drive in the morning, just in time to make David’s guided community ride. We poached the curb of a friend’s house and bounced between there and town for the various events over the weekend. A spirited game of Gelande Quaffing was the first step in the Decider process, which saw New York and Durango advance to the final test: a boat building contest. The catch? They were only allowed to use three cardboard bike boxes and three rolls of duct tape to construct a vessel that could survive a trip on the cold, Deschutes River. NY paddled away with the win but then, in the spirit of single speed giving, gifted the hosting rights to Slovenia. Oh, and there was a really fun bike race/ride, too. There were over 600+ riders who rolled to the start. 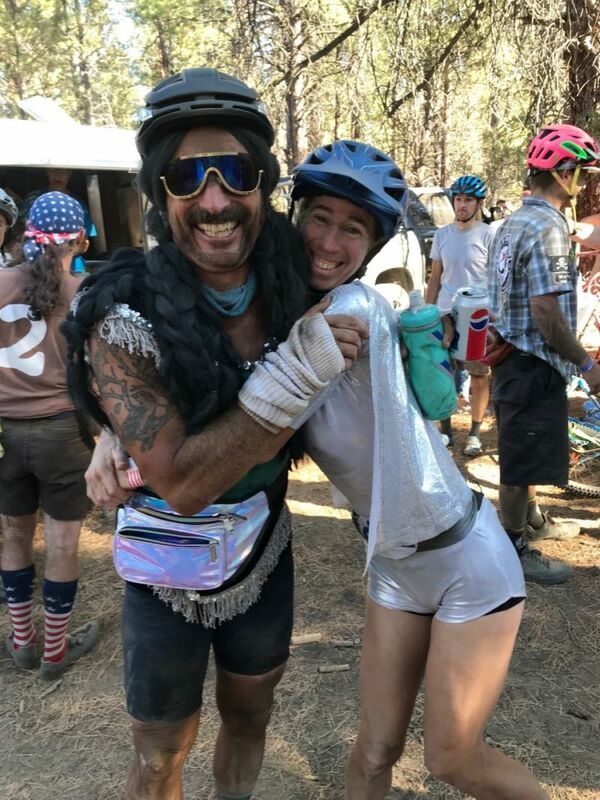 It was a collision of Burning Man and Sea Otter. A colorful crowd, most of them in some sort of costume. The race started neutral but went off with a bang. For real, someone fired a shotgun to signal the official start, and it got really hard. You could barely see at times due to plumes of thick moon dust that wafted in front of you, blindly pointing and shooting your rig with reckless abandon, your wheels carving lines like skis in a fresh foot of powder. I raced in one of my wife’s costume box items, an outfit other riders called Rick James/George Clinton/Milli Vanilli/Dread Natty Dread-a velvet blue, fringed, sequined unitard, paired with a matted brunette wig, some Flash Dance white arm warmers, an iridescent pearl fanny bag, and an amazing pair of $5 dollar, Palm Springs 70s shades. Once again there were aid stations with all the items beginning with B, and couches to sit on, and serenading musicians hidden in the woods. And you know what? Just like my first SSWC 16 years ago, I had the most fun ever. 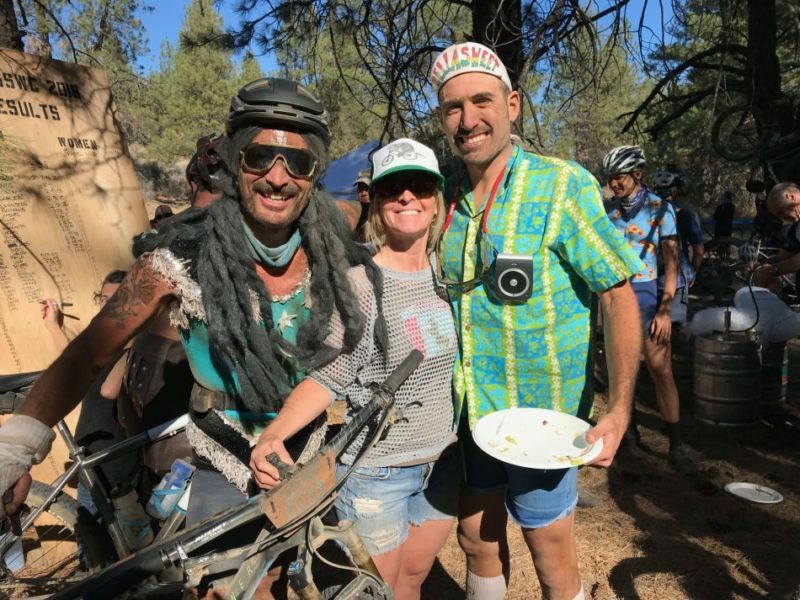 There’s something really special about the single speed clan, a two-wheeled family of sorts that draws from every nook and cranny of our diverse, and colorful, cycling community and congregates once a year. No one is excluded. All are welcome. And while costumes aren’t mandatory, they are appreciated. I was happy to fly the freak flag this past weekend.